Grand Rapids Medical Mile is home to LEED Platinum Certified Van Andel Institute (VAI). Founded in 1996 by philanthropists Jay & Betty Van Andel. VAI is an independent nonprofit biomedical research and educational institute committed to improving the health and enhancing the life of current and future generations through the study of diseases such as cancer and Parkinson’s. Along with its commitment to research, Van Andel Institute invests time in improving energy savings and promoting a healthier lifestyle in Michigan. 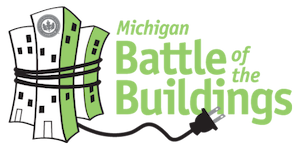 Van Andel institute is a proud competitor in the 2015 Michigan Battle of the Buildings competition and has been an inspiring LEED advocate in the Grand Rapids community since 2009. VAI was completed in two phases, with phase II designed and engineered to LEED standards. Building green and creating a sustainable workplace is important to the VAI team. It’s in their culture. Phase II designed in 2005 by world-renowned Rafael Viñoly was intended to pursue LEED certification but the team at VAI was surprised to learn from local architects at Fishbeck, Thompson, Carr & Huber that they had designed to the highest level of LEED certification – Platinum. VAI’s goals for this years competition include establishing metrics, building a baseline and increasing staff involvement. They joined the Battle of the Buildings because of their interest in energy and viewed it as an emerging opportunity. “Energy benchmarking has always been a challenge for us. There are not many labs to compare ourselves to so getting quantitative information has been difficult,” said Sam Pinto, Facilities Director at Van Andel Institute. Laboratories are hard to compare simply because they are so different from one another. Benchmarking requires an external standard and a large flux in laboratory design and limited choices in specialized equipment presents challenges in developing those standards. By participating in the competition, Van Andel Institute can get a new perspective on benchmarking from their local competitors and Energy Star’s Portfolio Manager. Developing a baseline to compare their current energy use against can help VAI map their progress and target areas of improvement. “There are always opportunities to look at your operation and do something innovative. It can be challenging at times but sharing ideas and data helps create awareness of opportunities and increases engagement within the workplace,” said Sam Pinto. The values at VAI have been and will continue to be driven with future generations in mind.